Time to throw on the apron and get those hands dirty in the kitchen this fall with Farm-to-Table Cooking Classes with Butter Beans, hands-on two-hour courses that will teach global cuisine with seasonal recipes. 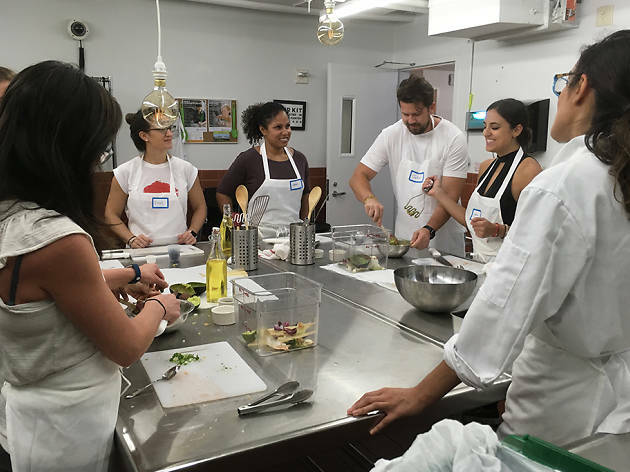 With six classes to choose from, you’ll learn tips on how to create healthy recipes with these farm-to-table cooking classes featuring local NYC market-fresh ingredients. 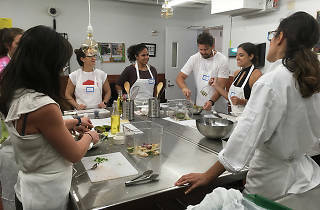 Hosted at Asphalt Green's Culinary Center in Battery Park City, each class will offer a complimentary glass of wine so you can do some sipping while cooking. Adult prices are $95 and use code BBTimeOut for $10 off your first class. I love this new concept in NYC! It was the perfect balance of Italian cooking, eating, and socializing. The hosts and chefs were full of food knowledge and had great personalities! I highly recommend this experience. I loved the Thai Takeout class I took with Butter Beans and I've since made the Pad Thai myself and it turned out just as well! Chef Giselle was a lot of fun and catered to your level of experience. Plus the food we made was delicious! I would highly recommend taking a class with Butter Beans and the Asphalt Green cooking facility was fabulous. I will definitely be coming back for another lesson! Definitely a fun different kind of night. Chef Giselle was patient, excited and gave great tips and lessons along the way. I did a tapas night and started off with some awesome sangria. The recipes were simple enough to repeat at home. And of course the best part, getting to enjoy the fruits of your labor, which was so good! Had a great time with this group and look forward to more! I invited my friends to take the class with me and we all ENJOYED it. The overall experience was fun. The teacher was very engaging and made sure every one in the class had something fun to do. The teacher was also very energetic. I would go back again and take another class from Butter Beans.I highly recommend it. I've never taken a cooking class before, but had the opportunity to join some friends for the Cinco de Mayo class. I don't cook a lot at home, but I still felt like an equal part in the kitchen. I loved how the class was just the right size (8 ppl). Everyone worked well together. The instructor was attentive and knowledgeable. And the food ended up being delicious with plenty to go around and then some. I would definitely recommend this class to other. It was a great time and you get a meal out of it as well! I took the Cinco de Mayo class with my friends and we had THE BEST TIME! The instructor/chef was so engaging, funny and knowledgeable.. The food that we prepared came from all fresh ingredients and was absolutely delicious.. We all sat down together at the end of the class and enjoyed a complimentary glass of sangria + a glass of wine and enjoyed what we had created. The ambiance in the kitchen during dinner was also very cute. I would recommend these classes for anyone looking for new cooking ideas, for girls nights, date nights, and just a fun night out to meet new people. I would definitely take another class with Butter Beans! Such a great class, I loved the teacher's enthusiasm and jokingly talking to the pasta, it was such an enjoyable night! I learned a lot and had a lot of fun, I definitely would recommend it!